Photograph collection of webmaster 25212 with a short engineers train at Stafford during December 1984. The nineteen and a half years of active service for 7562/25212 was spent allocated to only London Midland depots. Dual braked fitted (November 1978). Time between last Classified repair and withdrawal: 78 months. April 1967 to London Division - Western Lines (D01). March 1968 to Birmingham Division (D02). December 1970 to Nottingham Division (D16). 25212 was the 243rd Class 25 withdrawn, one of three retired during May 1985. After withdrawal 25212 was stored at Basford Hall until moved to Vic Berry, Leicester on July 7th/8th 1987 with 25191, 25278 & 25313. The locomotive was added to the famous stack, being removed late in October 1987 for cutting, being finally disposed of ny the middle of November 1987. Noted Crewe Works May & June 1969. Noted Derby Works November 1978 (dual braking equipment fitted). Noted Derby Works December 1982 & January 1983 (N4 repairs). With a varied LMR allocation history, 7562/25212 acquired an interesting mix of passenger workings. On March 31st a Birmingham New Street - Skegness day excursion used 7562 & 7503 from Nottingham to Skegness and the return to Birmingham. 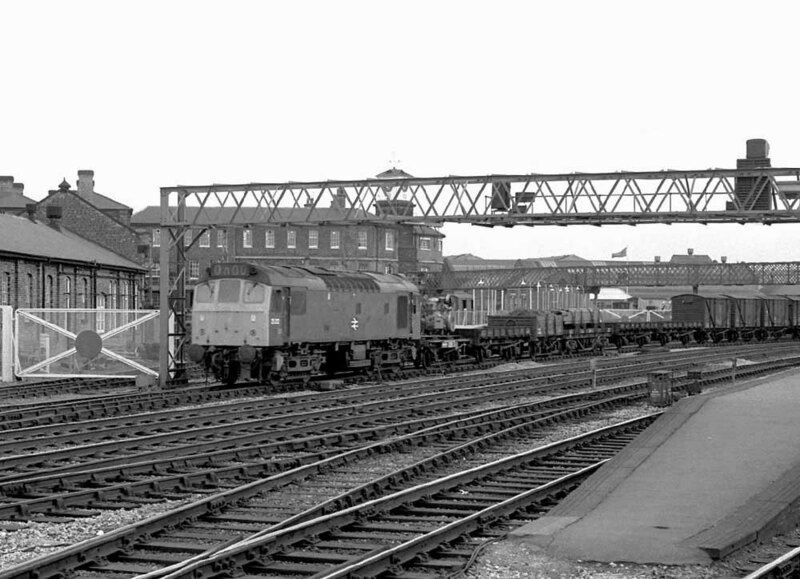 On March 24th the 6Z42 Earles - Exeter Central cement was noted at Exeter with 7568 & 7562. Three days later (March 27th) 7562 worked the 2B84 20.10 Exeter St Davids - Newton Abbot. From time to time the services out of St Pancras utilised pairs of Types 2s, on June 16th the 15.05 St. Pancras - Sheffield used 7562 & 5293 throughout. Passenger workings during 1974 included a Skegness - Leicester job on May 25th with 25101, and a round trip Nottingham - Llandudno Town (outwards from Derby) on August 31st. On January 17th the 15.30 St Pancras - Nottingham was worked forward from Leicester with 25212 assisting 45117. On April 8th (or 12th) the 10.25 St. Pancras - Sheffield required assistance from 25212 between Kibworth & Leicester after the Class 45 failed. 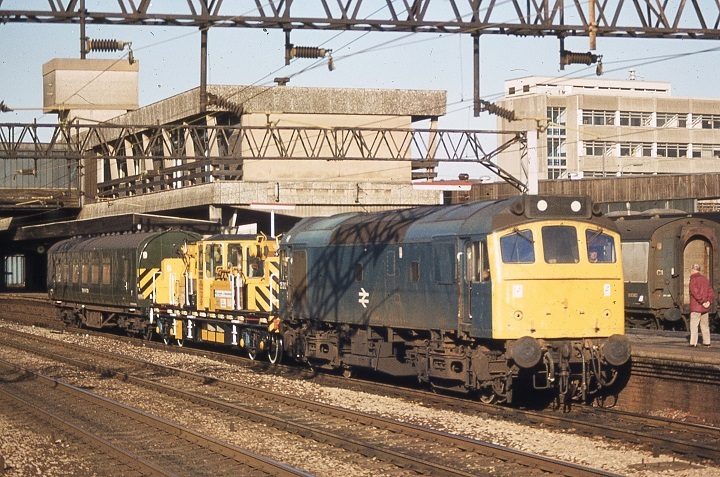 At Leicester the following 10.30 St Pancras - Derby surrendered its locomotive 45147 to the Sheffield service, whilst 25212 took the Derby service forward. On May 24th 25212 & 25159 worked the 09.20 Derby - Skegness and the 13.05 return. On August 9th the 08.00 Walsall - Yarmouth to Norwich and the 14.15 Yarmouth - Derby from Norwich were worked by 25212 & 25123. Photograph courtesy of Tony Sayer 25212 with a freight northbound at Derby on July 30th 1976. 25212 & 25280 worked the 09.20 Derby - Skegness the return Skegness - Derby on August 17th. When the 10.56 Cambridge - Doncaster diesel multiple unit failed at March on November 3rd 25212 was on hand to assist to Doncaster. The Heaton - Red Bank empty vans were worked by 25212 on December 8th. 25212 was noted at Frodingham along with 25102 & 25176. The last week of July 1977 proved to be quite busy for 25212. On July 27th it handled a round trip Derby - Skegness day out with 25269. The next day (28th) the same locomotives worked a Leicester - Skegness roundtrip. It was back to the east coast on July 30th, this time with 25175 on the Derby - Norwich - Yarmouth - Norwich - Derby diagram. The arrival of 25212 on the Peterborough - Liverpool Street parcels at Ipswich on February 11th was nothing unusual, except that the March driver left the train with no available local crew qualified to operate the Class 25. A Class 31 was found to remove the unlucky locomotive. North Wales was the location of two summer passenger workings for 25212. On August 18th 25212 worked the 15.32 Manchester Victoria - Bangor and 19.30 return. On September 2nd it was the turn of the 07.30 Nottingham - Llandudno Town and 13.02 return for 25212. Early November brought a variety of Class 25s to Kings Lynn, including a block oil train for the sugar beet factory with 25212 & 25310 (8th), deputising for a defective 37264. On April 25 a Peterborough - Leicester diesel multiple unit required assistance from 25212 after the multiple unit ran out of fuel. Two round trips took place over the Cambrian lines, on June 9th with 25218 working the 10.10 Euston - Aberystwyth forward from Birmingham New Street, returning with the 16.10 Aberystwyth - Shrewsbury. On June 16th the 10.10 Euston - Aberystwyth from Birmingham New Street and the 16.10 Aberystwyth - Shrewsbury were worked by 25212 & 25262. Towards the end of June (29th) the 17.10 Poole - Nottingham was noted at Derby behind 25212. On October 8th 25212 was southbound through Oxford with empty carflats for Eastleigh. Photograph courtesy David Smith 25212 & 25040 await departure from Nuneaton on October 23rd 1980 with the T43 job to Bescot. 25040 is only along the for the ride to Bescot as it required repairs. Ironically 25040 was not long for this world, it was taken out of service the following month. On September 29th 25212 & 40006 worked the Ellesmere Port - Cranmore bitumen tanks. The Mountsorrel – Radlett ‘Redland’ stone working regularly required two Type 4 machines to handle the forty eight loaded wagons, however on May 14th 25212 & 25207 were in charge of forty seven wagons. 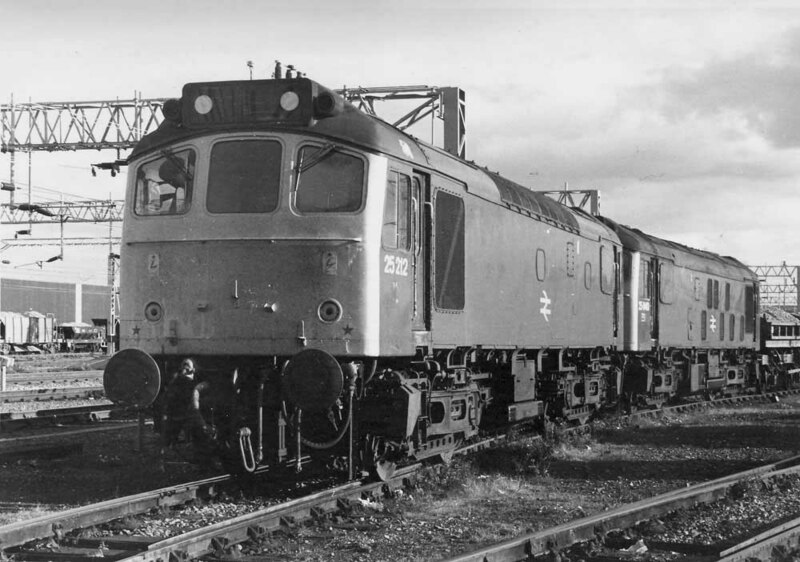 On September 9th the 19.26 Barrow - Preston and the 22.25 Preston - Barrow were worked by 25212. On May 28th 25212 & 25202 worked the 07.44 Shrewsbury - Aberystwyth and the 10.10 Aberystwyth - Euston to Wolverhampton. Three weeks later on June 18th the 08.38 Leicester - Skegness and the 12.37 Skegness - Leicester were worked by 25212 & 25106. The Ellesmere Port – Riverside tanks ran with 25231 & 25212 on August 9th. On September 3rd the 10.10 Euston - Aberystwyth from Birmingham New Street and the 17.15 Aberystwyth - Manchester Piccadilly to Crewe were hauled by 25212 & 25200, the return working had been extended due to late running. On September 27th the Ditton - Broughton Lane BOC tanks was hauled by 40033 & 25212. The year closed with 25212 working the 18.20 Glasgow Central - Manchester Victoria forward from Preston on December 30th & 31st - hopefully the nights weren't too chilly. The workings for 1984 focused generally on the North West. Weather problems on January 23rd saw the 10.15 Euston - Glasgow Central hauled from Carlisle to Newcastle by 25212 & 25185, where the train was terminated. On February 15th 25212 worked the afternoon Fords Halewood - Whitemoor, the next day (16th) the evening Parkeston – Ditton working was noted with 25095 & 25212 on February 16th. The 21.44 Preston - Liverpool was worked by 25212 on April 13th, whilst on May 28th a Blackpool North - Manchester Victoria was worked to Preston by 25212. Photograph courtesy Phillip Moore Having survived a visit to Derby Works late in 1982 for minor repairs, 25212 would soldier on until withdrawn at Crewe in May 1985. 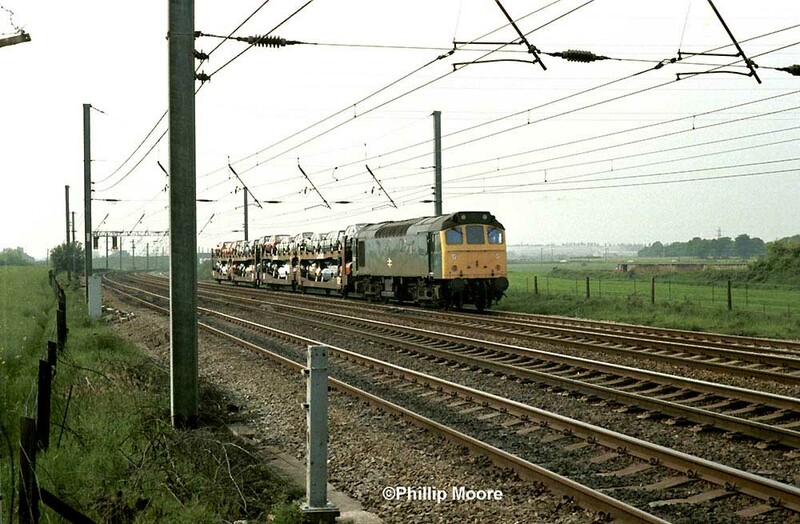 Seen here in this fine view at Winwick Junction on June 6th 1984 25212 works a short train of new cars. Photograph collection of webmaster On July 4th 1984 45132 heads west through Stalybridge with the 16.14 to Liverpool whilst 25212 heads east with a loaded oil train. Depending on the load 25212 would have certainly coughed going up towards Saddleworth, it's only 15 mph through Stalybridge, so basically it's a standing start assuming the signal at the end of the platform is green, if it wasn't, you had two colour light intermediate block signals to encounter on the bank. 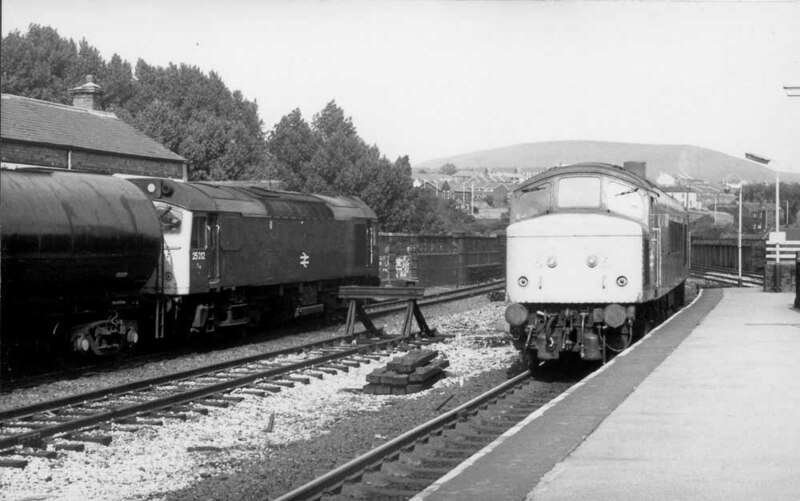 On July 13th 25212 hauled the 07.10 Morecambe - Leeds due to a diesel multiple unit failure. On July 18th it assisted the same working between Morecambe & Lancaster. The final passenger working for 25212 took place on August 1st working the 17.32 Bangor - York as far as Manchester following the failure of 40015. At Manchester Victoria 45044 took over. Noted at Westbury stabling point on June 24th were 25212 & 25191. 25212 was noted at Willesden South Sidings on March 25th with ballast wagons, the same day it was also noted at Cricklewood. Noted on April 30th(?) were 25212 & 25058 running light to the Wirral. Noted on May 1st & 2nd were 25212 & 25058 on the Ellesmere Port – Severn Tunnel Jct bitumen tanks. On May 10th 25212 was noted at Stockport on a short train of short-wheelbase tanks. 25212 was withdrawn on May 12th 1985. Page added February 23rd 2013.